Choice Hotels has revealed the details of their Summer promotion and low and behold it is pretty much the same offer we see from them. They word the promotions differently in terms of get a free night, get a $50 gift card etc. however the gist of the promos are the same, they will award you enough bonus points after you complete 2 separate stays to have 8,000 points after those stays. 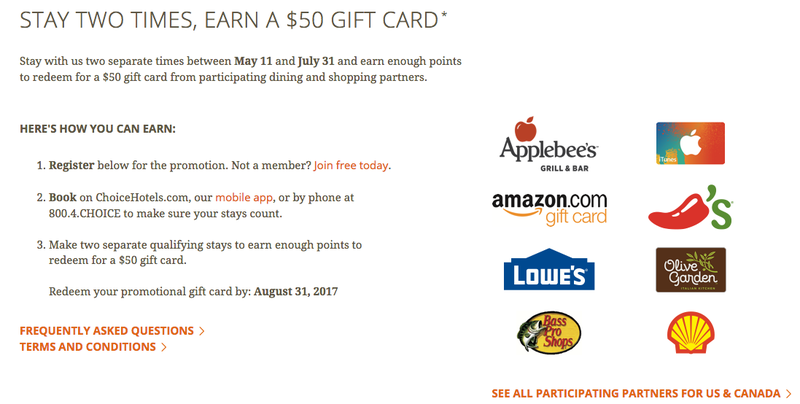 In this case it is the $50 Gift Card offer, which mean you can use those 8,000 points to redeem for one of the featured cards at the 8,000 point level instead of 16,000 points if you redeem by August 31st (they have shortened this promo by one month from last year). Your better option is to use those points towards a future award night or even conversion to an airline program to top off an account for an award ticket.